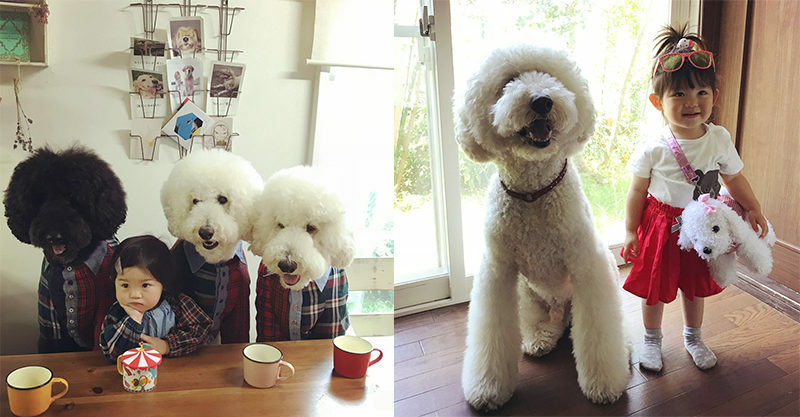 Two-year-old Mame and her poodle pals Qoo, Riku and Gaku are the very definition of friendship goals, and things have been that way since the little girl was born. We know this because these buddies are the stars of a world famous Instagram account and blog run by Mame’s grandmother. They undertake the important work of delighting every one of their 460K plus followers on the reg. Fans are loving it and keen to share the reasons why they double-tap daily on this account – and these dogs! While Mame and the pups were the original focus of this adorable ‘gram they recently switched things up. Yep, the family added a tiny accomplice to this kid-doggo gang – a baby boy named Mugi! Photogenic pups Qoo, Riku and Gaku are beautifully groomed within an inch of their fluffy lives and are captured adventuring with Mame, or simply lounging about like doggy couch potatoes at home with the toddler and her wee brother. Let us show you what we mean …! NB: If this post has you hankering for a pup, don’t forget to head to your nearest shelter to scope the idea out!